have a heavy heart and a lot weighing on my mind right now – and I wanted to share my thoughts with you. I don’t know that I can fully do this justice, but I want to try. When I was a teenager, embarking on the summer of my sixteenth season, I was encouraged to get some sort of employ to keep me out of the house and out of trouble. Following both a girl and the encouragement of my father, I became a camp counsellor. 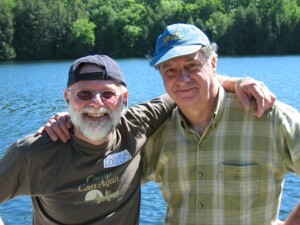 My father encouraged me to go to camp (as he had been a counsellor in his youth), and the girl led me to Camp Can-Aqua. Despite some reservations, I was quickly welcomed into what I would discover was not just a camp, or a summer job, but a family. The patriarch of which was Louis Gyori, an enthusiastic, sometimes brash and sometimes wise man whom brought me out of my shell. Over the course of the next five years I became part of the camp – I ran the Canoe Program, I became the Waterfront Head (to which I was known as ‘Dan, Dan the Waterfont Man’ sung, everytime…) – I learned Campcraft and Woodworking skills, I fell in and out of love, and I made – as the brochure promises – friendships that will last a lifetime. Something about the camp and it’s teachings got into my blood, under my skin and sunk in. A feat that I can’t say all of my publically funded teachers were able to achieve. I don’t know that I fully appreciated it at the time – I knew I had something valuable, I knew that I loved it. But I stopped going to pursue my career, to travel, and though I see some of those friends from time to time, I lost touch. Until yesterday. Over the weekend, Louis Gyori, a friend, a mentor, a guide – a man who had a positive impact in my development as a person, passed away. He was the keystone to hundreds of kids finding their way, building a thriving camp and maple syrup business from nothing more than a few ramshackle buildings and a philosophy – in a nutshell, helping kids become self-confident, positive people willing to contribute to the community. It was about learning to get along. And it was about fun. Louis wasn’t just the founder of the camp, or the camp director – he is camp. Can-Aqua was a physical extension of everything the man was – and it was overwhelmingly positive. He was an inspiration not just to campers, but to the community to which he belonged year-round. He sponsored programs for local youth, made room and donated spaces at camp for Children’s Aid Society kids, all while being a medical marvel that turned his lifestyle around into a healthy one after surviving major heart surgery in his early adulthood. When I found out, I was suddenly struck with a profound sense of loss. In the last 24 hours, I’ve chatted with dozens of old friends, shared hundreds of pictures and reconnected with a huge network of people that all feel the same way – generations that have all been impacted by one man. Because of that, in that loss, I realized how much I had gained. What I had, and what I have. Though I can’t truly share the sentiment that my fellow Can-Aquaians and I are feeling at this point, I think what I’m trying to convey is: Don’t take it for granted. Think of the people whom have spent time with you, encouraged you, helped shape you and reach back out to them. They took time out of their lives to interrupt yours, and made sure that you followed a path. They helped you grow. Be it a parent or teacher, a camp counsellor, a swimming instructor or a ‘Big Brother’ – you know that person – write them a note. Give them a call. Let them know that you appreciate them giving you that gentle (or rough) shove forward in life, and that you wouldn’t be where you are now without them. Let them know they made a difference. Who is it for you? Who touched your life, and how? Louis Gyori – for all that you are, and all that you’ve done, you’ll be missed. We are the ripples, and you were the rain – I hope that we can do you proud and carry forward your positive energy and enthusiasm. Rest in Peace, my friend.